Peter has started a blog. Read Blunders on the Danube to follow Peter's multi-part exploration of Bob Jones' Die Fighting and other wargaming stories. Welcome to Peter's Wargaming Page. This page serves as the Internet home for Peter Anderson's wargaming activities as well as a resource page for the upcoming Piquet - Band Of Brothers rules, version II (late Medieval-Renaissance 1200-1600). PIQUET (Fr. pee-kay, anglicized pick-et) is a paper time machine that lets you ride with Joan of Arc, command an army under Henry V, or try to improve upon the battlefield performance of Charles the Bold. Would you like to hear the whistle of arrow shafts at Agincourt? Or smell the sharp acrid haze of burnt black powder at Pavia? Can your mind's eye see that ridge across the way lined with the famed Winged Hussars of Poland? Let PIQUET provide the catalyst for your imagination! PIQUET is a unique miniature wargame system that provides a master set of rules for a wide range of periods. This core set, once learned, allows the wargamer to easily game in any time period without relearning volumes of rules, or the need to constantly remount figures. PIQUET is innovative using entirely new combat, command and movement systems. It includes the breakthrough "Sequence Deck" concept that makes every gamer a game designer, and makes every game a highly dramatic contest. You will find PIQUET the most different and the most fun wargame you have ever played! 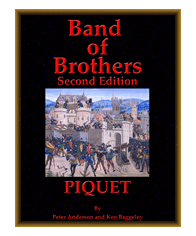 Band of Brothers is a Piquet Supplement designed to simulate the battles of the Medieval era (1200 - 1600). Peter is curently working on the Second version of Band Of Brothers which will cover late Medieval to Renaissance era. For those familiar with Band Of Brothers Version I, there have been extensive changes made from the 1st Edition for the new version. Almost no area remains unchanged. It is strongly suggested that experienced Band of Brothers 1st Edition gamers carefully read all the rules. Piquet also has its own discussion group where Piquet players and authors get together to discuss the rules in detail. Peter is usually online and happy to answer questions about Piquet in general and Band of Brothers in particular.